If you’re already using our security plugin Defender, you might’ve noticed a new feature we snuck in a few weeks ago. But let’s make it official: We’ve added two-factor authentication to Defender! Many WPMU DEV members were at a loose end when Clef was sunsetted back in March. The service offered a simple security solution for two-factor authentication, along with a free plugin and app for WordPress. It was awesome. And then it just disappeared. So we thought, why not add it to Defender? So we did. We’ve added two-factor authentication to both the free and premium versions of Defender, so when you next update Defender for your site/s just enable this new feature to get started. Two-factor authentication adds another layer of security to your site that requires not only a password and username when logging in, but also a passcode that you can only generate on your smartphone. Using a username and password together with a piece of information that only you can access makes it harder for potential hackers to gain access to your website. 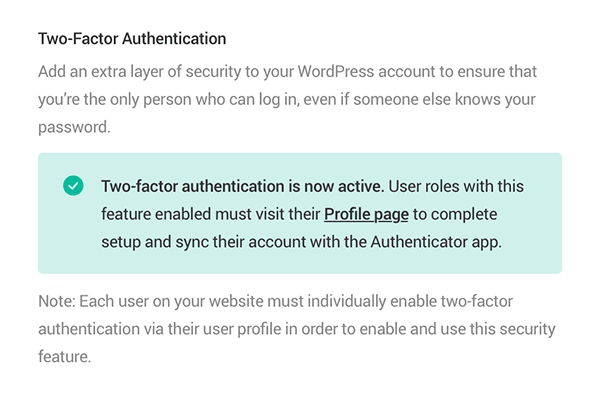 For more information on two-factor authentication, check out the entry in the WordPress Codex. If you already have Defender installed, start by updating the plugin to the latest version. If you aren’t using it yet, you can enable it in The Hub. Or go to the WordPress Plugin Directory to download the free version there. Simply click Activate to enable two-factor authentication. Click Activate. The message will refresh to let you know two-factor authentication has been enabled for your site. 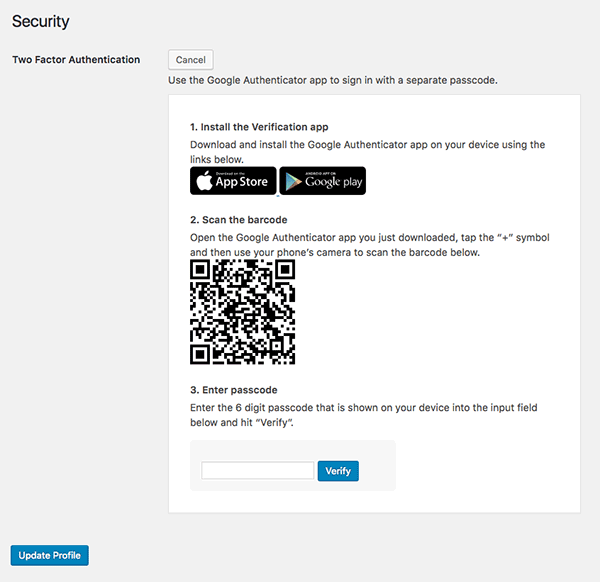 Go to your user profile to sync your account with the Google Authenticator app and complete setup. Defender requires all users on a site to enable two-factor authentication in their user profile, as well as sync their account with the Google Authenticator app. To do this, click on Profile page to go to your user profile for your site. You’ll be taken to your profile. Scroll to the bottom and click Enable. Enable two-factor authentication in your user profile. Install the Google Authenticator app to sync Defender with your phone. Follow the steps by downloading Google Authenticator for your phone, scanning the barcode, and entering the six digit passcode that the Authenticator app generates. Click Verify and you’re all done! Next time you log in to your site, after you enter your username and password, you’ll be asked to enter a passcode. 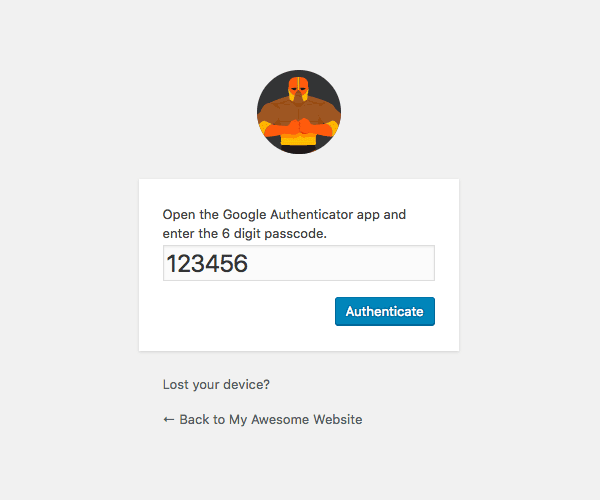 Just fire up the Google Authenticator app on your phone and enter the passcode. Enter your passcode to continue logging in to your WordPress site. User Roles – Enable two-factor authentication for certain user roles for your site. Lost Phone – If a user is unable to access their phone, you can enable an option to send a one-time password to their registered email. Active Users – Site admins can view a list of users who have the feature enabled. Deactivate – No longer require two-factor authentication for your site? Simply turn it off. I’ve been using Defender’s new two-factor authentication feature on my own personal sites for a couple of weeks now and it’s awesome. I don’t have to worry about brute force attacks, and logging in is super easy. I’m so used to it not that it’s almost like I’ve always had this feature on my site. If you’re a member, update Defender today to get started using two-factor authentication. Have you already set up two-factor authentication for your site with Defender? If so, let us know what you think! And if you have any other feature requests for Defender, let us know in the comments below. I notice that you use three different ways of saying 2FA; 2 Factor Authentication, Two-Factor Authentication and Two Factor Authentication. Maybe you could pick one for consistency. Don’t like the Defender pic on the login screen. Please allow us to remove it or simply show the standard logo. You make it seem like one can only use the Google Authenticator app but you can actually use other apps as well. I have enabled 2FA via 1Password and never use the Google app. Maybe you could make it more generic and mention a couple of alternative apps? The email you get with the login code when you have lost your phone is a little boring. It just lists the code. It would be cool if we could edit the content of that email and make it more personal. Thanks for your feedback! The grammar issues should be fixed up, I’m finding out what’s going on there. The rest of your suggestions are great and I’ve taken them to the drawing board. +1. Love all the ideas mentioned here. Could the Ultimate Branding plugin change the Defender graphics too? You can easily go around the 2 Factor as right now it lets you in on a normal way even 2 factor is enabled. This should be fixed immediately! Otherwise people might thing 2 factor is safe and wonder why somebody went in without! How do you get around Defender’s 2FA implementation? Coming soon is the ability to force two-factor on those user roles (if you want to) so that they must use it. Ah, but doesn’t it work like that everywhere? I can’t think of a site or app that requires the use of 2FA. Maybe the fact that 2FA is available on a site could be promoted some other way? I saw this feature but haven’t looked into it yet. What I’m really looking for is a firewall feature that protects the wp-admin page just like the Sucuri firewall product. I know of sucuri but don’t really know anything about it until I stumbled on it. Elegant Themes is using this feature on their wp-admin page. Right now I’m using the directory password protect through my hosting. I definitely prefer something similar to what sucuri is offering. I’m sure there’s a plugin out there that does just that but at the same time I’m not a fan of having too many plugins. +1 for hiding /wp-admin/ as well as /wp-login/ for unwanted user. This is going to be so helpful! No more scouring user activity logs to ensure that there haven’t been any security breaches! Awesome functionality. Are there any other authenticators on the roadmap? Since I’m anti-Google Authenticator since I don’t want an authenticator on my G-Suite email. It’s not on the road map (yet!) but I passed your suggestion to developers and project manager and they will consider this new feature. I have been using SAASPASS instead of Google Authenticator. Works great and backs up the profile so you are covered if you change phones or add phones. I’m using 1Password and it works great. You don’t have to use the Google app if you don’t want to. Do you plan to have a feature where 2FA code is sent to email? At the moment we have feature “Lost Phone’ – that allows to get code to email in case there is no access to phone. Is this feature you are looking for? I think he means that instead of the 2FA code being generated by an app, the 2FA code is emailed to you.